As EMIR is a common-user instrument, it has been designed to meet many of the broader requirements of the astronomical community. It is therefore a versatile instrument that will accomplish a wide variety of scientific projects. For more detailed information see the Manuals. The construction of EMIR pushes the boundaries of large-telescope instrumentation to new limits. The GTC 10 m aperture translates into a physically large focal surface. Matching the images given by the telescope to the small size of current detectors requires large optics with fast cameras. Large, heavy optics need advanced mechanical design and modelling to bring flexure down to acceptable levels. To work in the wavelength region beyond 1.8 µm, the EMIR optical system and mechanical structure have been cooled to cryogenic temperatures (77 K). Temperature stability and cycle-time requirements pose stringent demands on the design and performance of the instrument’s cryogenic system. 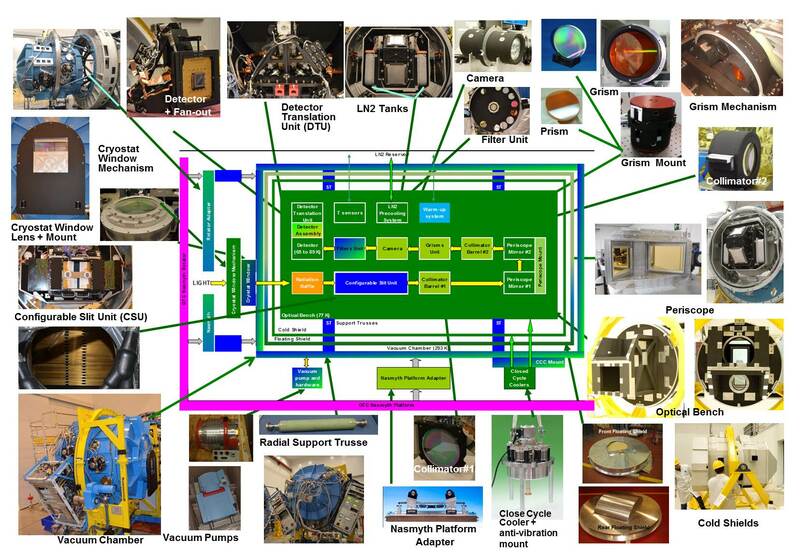 The key modules of EMIR are the DTU and the CSU, fully integrated in the instrument main vessel, to allow the correction of the flexures and to create remotely configurable multislit patterns for GTC’s intended queue observing, without warming up the spectrograph.